There’s a knack to catching your holiday snaps in the reflection of your sunglasses but the effects can be stunning and some people get really arty with them. 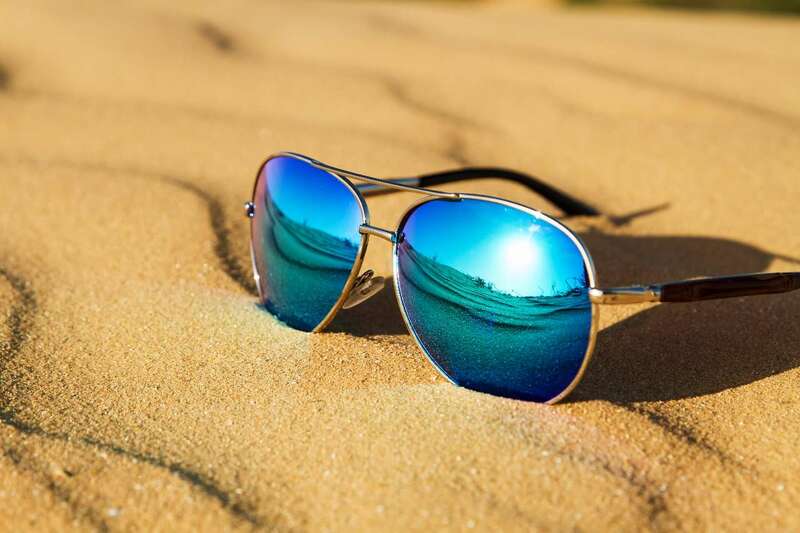 Our selection of #sunglassesreflections shows some pretty famous places, faraway beaches and abstract shots like palm trees or glasses ‘left’ strategically in the sand, as well as plenty of selfies. Why not see if you can guess where the picture was taken before you scroll down? We’ll give you the answer under each picture we know, but some are a mystery even to us. You’ve got to love this shot for the composition alone. It could be on any length of sand in the world, but it makes us wanna be there. Huge valleys with sheer cliffs, scarce foliage and bright blue skies – it has to be the Grand Canyon. Hope she didn’t have to stand too close to the edge to capture this. This almost doesn’t look real as the palms are identically placed in each lens. We can believe it is though as it’s taken in Majorca, which is utterly gorgeous. We’re not sure if it’s cheating taking your glasses off to do a sunglasses reflection shot but this picture of Zurich is so good we don’t mind… And brownie points for the cool Ray Bans too. With the famous Los Gigantes cliffs in the shot accompanied by a yacht-filled marina, it’s safe to say this reflection sums up the iconic Tenerife resort. The amount of different blues in this picture is stunning, but can anyone tell us where this is in Cancun? This is most definitely an eye-catching view of Lake Como, can anyone spot George Clooney? Looking calm, cool and collected, this sightseer has captured one of Barcelona’s most iconic landmarks in her reflection. Landed in #langkawi Always a way to sneak myself into a picture ?? #langkawibeach #langkawiisland #pantaitengah #malaysia #sunglasses #sunglassesreflection #reflection #iphoneonly #iphone6 #sunseasand #instatravel ?? Selfie alert! @chrismoonofficial has managed to sneak himself into the reflection in this photo. Though, we’re not sure if it’s classed as photobombing when you’re taking the picture. And if you were wondering where this fantastic photo was taken, it was snapped at the tropical paradise of Langkawi Beach in Malaysia. No prizes for guessing where this was taken, I’m afraid. It’s only one of the most iconic places in the world – yup the Capitol Hill. Swapping the sunshine for a snowy paradise, this winter wonderland destination boasts the most enchanting views. Hot chocolates by the fire, days of endless skiing, and bubbling hot tubs on the coldest of days. Taken by the side of a lake in Finland, this picture oozes cool. From the red lipstick to the Beatles-esque round glasses and hip hangout. If this image doesn’t make you want to go on holiday, we don’t know what will! Oozing tranquility, days by the poolside are exactly what you need to catch up on that R&R. This reflection makes Plaza Mayor in Madrid look even bigger than it is. What you might not know about Plaza Mayor is, it’s not all expensive coffees and portrait artists, you can get a cracking calamari sandwich there too. Oh to be watching a Dominican sunset right now. The beautiful sight has been encapsulated in this shot from @jessicaradbourne Caribbean adventures. Isn’t the sky such a delight, perfectly formed clouds and the bluest of skies – certainly a sight for sore eyes. Captivated by the warm glow of the lens, Disney World never fails to showcase its beauty. The Duomo in one direction and piazza in the other, this Milan selfie is really clever, and you can barely see the phone in the reflection either. Sri Lanka sure looks beautiful from this angle, great for snorkelling and spotting sea turtles, we hear. In this picture we spot one of the world’s best beaches, imagine if this was your view. This shot of colourful umbrellas taken at Borough Market, London, is so pretty we don’t mind that it’s not a holiday picture. Although it could almost be in an Asian street market. George Ezra didn’t sing about Budapest for any old reason and this picture captures the beauty of the city in technicolour due to the coloured lenses. Taken from a peak of the Colorado Mountains overlooking Lake Dillon, we don’t envy @ikonstantin1984 for the climb up, but kudos for the great shot. Hexagonal glasses might be a new thing but beach breaks in Bali are an old favourite, plus the sand, sea, sky combo is making us crave a holiday. Did anyone spot where this is? If not, it’s La Rotonde Stalingrad in Paris. Just as beautiful inside, it’s a swanky bar and restaurant. Palm trees in Mexico backed by a pink sky, do we need to say more? We’re not sure if it’s due to the colour of the sunglasses or the sunset, either way this lucky guy is getting a great view. We’ll finish with friends on the beach – a gorgeous, smiley picture that says ‘call your friends and hop on a plane’. Did you guess where any of these pictures were taken? We’re keen to hear from anyone who knows the places we didn’t. And do you have any sunglasses reflections pictures of your own? If so, we’d love to see them on our Facebook or Twitter page, especially if they’re from a Holiday Hypermarket trip.